Just a few minutes outside of Edinburgh's bustling city centre and you'll notice the air starts to smell fresher, streets widen into comfortable avenues and trees breathe a sigh of relief. If you'd like a respite from the buzz of the capital, then the Marchfield Residence is just right for you. Sleeping up to five guests in delicious comfort, this main door apartment even has a beautifully tranquil garden and free parking on site. Now, don't say we never spoil you! Lovingly decorated with touches of chic, Parisian style, the Marchfield Residence invites you to channel your inner Holly Golightly. Sip a morning coffee in the enormous lounge, and we guarantee you'll feel every inch the cosmopolitan jet setter. A generously proportioned flat screen television and uber comfortable sofa await you, so you can kick off your shoes and settle down to a movie marathon after a hard day of adventuring. Soft, fluffy dove-grey carpets and a glorious Paris-themed feature wall add a blissful sense of warmth to this fantastically large room. Moving through to the kitchen, again you'll marvel at the space. Seamlessly connected to the living room, the kitchen continues to exude chic, with a pallet of light wood and lush greys. All the modern conveniences of home can be found here, so whether you're a whizz with the oven or the next Marco Pierre White, you'll feel right at home. There's no need to even fight over who does the washing up - this property includes a dishwasher, so you can make the most of your well deserved you-time. Why not take a crisp glass of wine and some nibbles collected from the Castle Terrace Farmers' Market (every Sunday, and well worth checking out!) out to the garden to make the most of the shy Scottish sun. This property includes access to a spacious and immaculately well kept garden. We can't promise you Parisian style weather, but we can promise that you'll feel ten times lighter after a relax in one of the Marchfield's comfortable garden lounge chairs. When it's time to catch a well deserved rest, you have two bedrooms to choose from, as well as a comfortable sofa bed in the lounge. The master bedroom features a delightfully soft kingsize bed, so feel free to stretch out and have yourself some very pleasant dreams. A second bedroom features both a single and a double bed, so there's plenty of space for the whole family. Both bedrooms are in-keeping with the property's elegant, quirky style, and so all you need to do is lie back, relax and drift away to the land of nod. A family shower room completes this terrific property, and the owner has included a number of wonderful extras, such as Freeview Tv, an iPod dock, digital radio and super fast broadband. We can promise that you'll never hear those dreaded words: 'I'm bored!' from anyone in your party. To make things even easier, a travel cot and highchair are available, so the whole family can be accommodated. The local area is one of Edinburgh's most charming - a delightful residential area tucked away from the hustle and bustle. 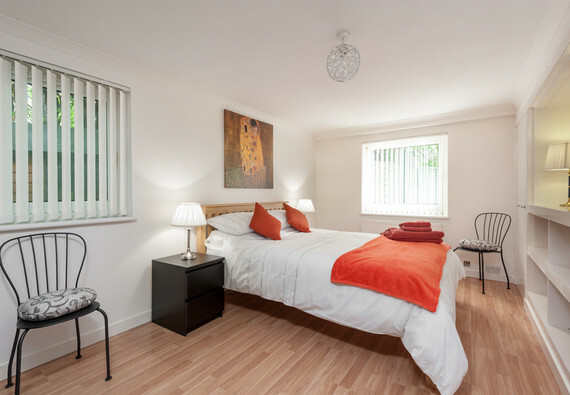 The city centre is a mere hop, skip and a bus away, however, so this property really is the perfect choice for those of us who like both adventures and a really good night's sleep. Entry to the apartment is from 16:00 onwards; however, please note that arrivals after 19:00 will incur a late fee of £15, and arrivals after midnight will incur a fee of £25 for unsociable hours. Earlier entry can perhaps be arranged but depends if there is a departure at your chosen apartment that day. This can be confirmed within 48 hours of arrival. If you are arriving earlier than 16:00 on your day of arrival, it is always worth contacting the property manager as they will always endeavour to give you access as soon as possible. You may be able to arrive early and leave luggage and come back however this is not guaranteed. Sleeping arrangements 1 kingsize double bedroom, 1 bedroom with 1 double bed and 1 single bed. Double sofa bed in lounge. *Please note that the sofa bed is intended to provide flexibility for sleeping arrangement, however the maximum occupancy must not exceed 5. Accessibility statement This property is a ground floor flat, accessible via a main door. No reviews yet for The Marchfield Residence.